It seems like the issue will be with fitting SA brakes on a non-SA van. It may be that the SA hardline is always behind the axle whether 2WD or Syncro in which case I'm guessing the Busschmeide hoses are probably sized to match an OEM setup like that. If I need to look at a banjo fitting do I need M10x1 or M10x1.25? Unless they are different to the standard caliper fittings m10 x 1....... but why go for banjo style when you can use standard design (at least with Goodridge)? 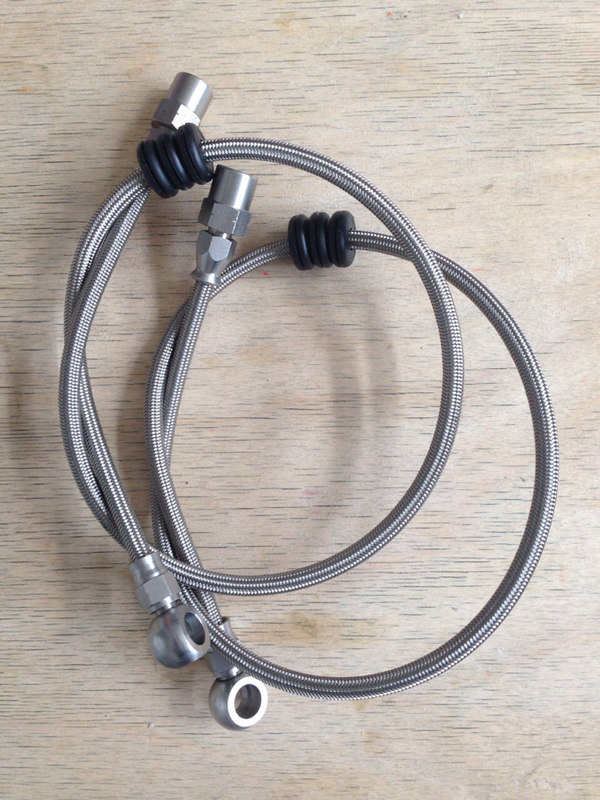 The location of the inlet on the SA calipers is on the top face at right angles to the run of the brake hose, and so lends itself to some kind of right angle connector such as a banjo connector, rather than some type of inline connector. Standard SA 2WD hose works perfectly. 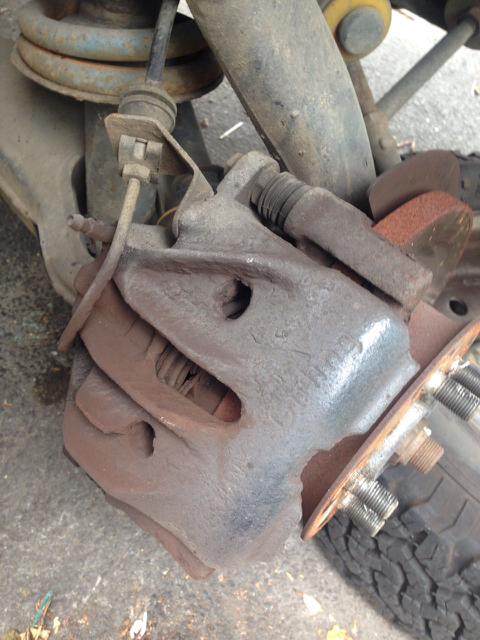 You do need to lengthen or replace your brake pipes to extend to the rear of the spring seat. There is already a hole in the chassi for the bracket to fit. So whatever you do, you will have to make up some brake pipes to make it all work. Its Sykes Pickavant flaring tool time. Presumably it's possible in the interim to run a custom banjo fitting flex hose until the hard line pipes can be moved? The length should be fairly easy to determine from the current setup. Also, would it really be necessary to fit a spring 'shield' as appears to be present in Ian's first picture? I'm having a go with Goodridge stainless braided hose and fittings as this allows me to size to length by offering up to the existing setup. Okay I've got the first side fitted. I used a Goodridge flex brake hose to connect the hard line in front of the wheel to the caliper. This hose basically follows the route of the standard 2WD / Syncro brake hose, but with a banjo fitting to the caliper in place of the short hard line in the OEM setup. Long term the setup will probably evolve to the standard SA OEM routing with the hard line moved to behind the wheel and a shorter flex hose. The length of the flex hose i ended up with is 600mm from end of female fitting to centre of the banjo. A couple of pictures- the retaining spring wasn't fitted for the first image. I only managed to get the first side fitted and bled today - I'll tackle the other side tomorrow, and then take the van for a run to bed them in. - a 3mm spacer is needed with the 16" OEM steel Syncro wheels otherwise they seem foul on the edge of the caliper. You also need a pair of M16x3.0 washers between the brake carrier and steering upright to properly centre the carrier to the brake disc. Most parts are now NLA, although the repair kits are still available through VW Classic in Germany, brake pads and discs can be sourced from Brickwerks, and Busschmeide does replacement flexi-hose sets. And do you think the van stops that much better now ? The brakes feel a bit more modern in the way they respond, if that makes sense, particularly if braking quickly for whatever reason. 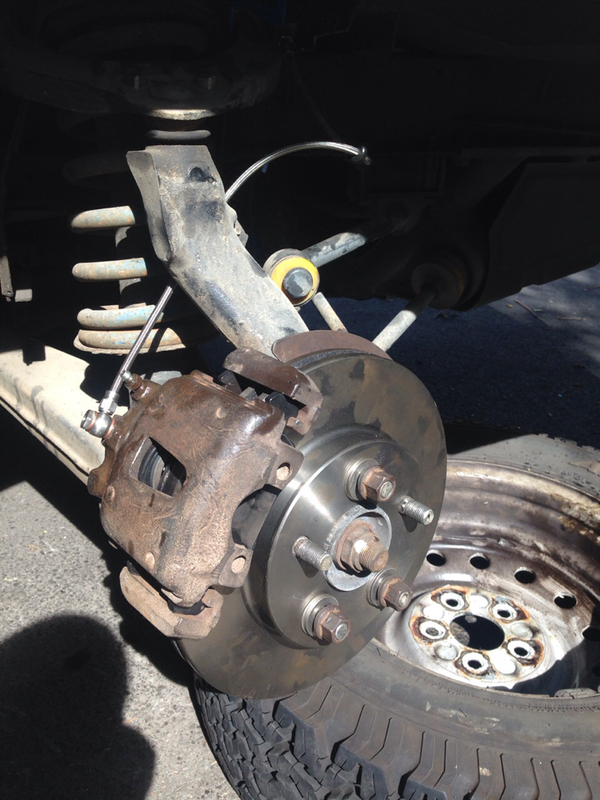 The main reason for changing them over though was to prevent the overheating / brake fade issues we've experienced previously, and they seemed to do this did very well this summer in the picos de europa. clift_d wrote: The brakes feel a bit more modern in the way they respond, if that makes sense, particularly if braking quickly for whatever reason. The main reason for changing them over though was to prevent the overheating / brake fade issues we've experienced previously, and they seemed to do this did very well this summer in the picos de europa. You can thank the Goodridge hoses for some of that they really do make a difference to pedal feel and initial bite. If the fade was from fluid boiling then a change of fluid (higher boiling point, not just fresh DOT 4) can also solve that. 937carrera wrote: If the fade was from fluid boiling then a change of fluid (higher boiling point, not just fresh DOT 4) can also solve that. Understood, but it was basically down to the brake discs / pads overheating - the smell was chronic.